When Leo Buckley, executive director for Business Services in Patient Care Services, was growing up, his father passed along a life lesson that has served him—and others—well. “He always told me, if you do something kind for someone, you will have a good day,” Buckley said. His father’s words echoed in Buckley’s mind last month when he met the young recipient of a bone marrow transplant. Mikalo Glennon, now 5, was just 18 months old when he was diagnosed with leukemia. He went into remission after undergoing two years of chemotherapy treatments, only to relapse six months later. His doctors at Children’s Hospital told his family he would need a bone marrow transplant to survive. Hanley’s friends and coworkers from the NICU volunteered to staff the drive, which ended up recruiting about 200 potential donors. 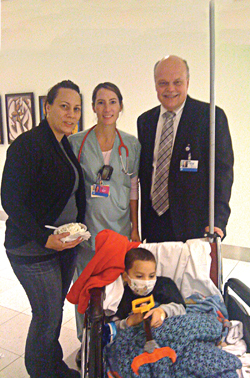 A week later, they received the good news that one of the donors who registered was a match for Mikalo. Nine months after the transplant, Mikalo’s health continues to improve. He was with his mother and aunt following a procedure when they coincidentally ran into Buckley. Buckley says that while helping organize the bone marrow drive was simply part of his job, it doesn’t make the end result any less rewarding.